It's another TGF Farm Fresh Monday Funday challenge! Today's host is our wonderful team captain, Margie! The challenge...rule of 3 - use three of any item - ribbon, brads, buttons, etc. For my card, I have three ribbons, three colors (Mickey Mouse ears, pants, and shoes), and three designer papers. The base is Stampin' Up's Real Red with layers of Daffodil Delight and Basic Black. The designer papers are from Paper Studio, Reminisce, and Sandylion. The border punch is EK Success' dotted scallop. 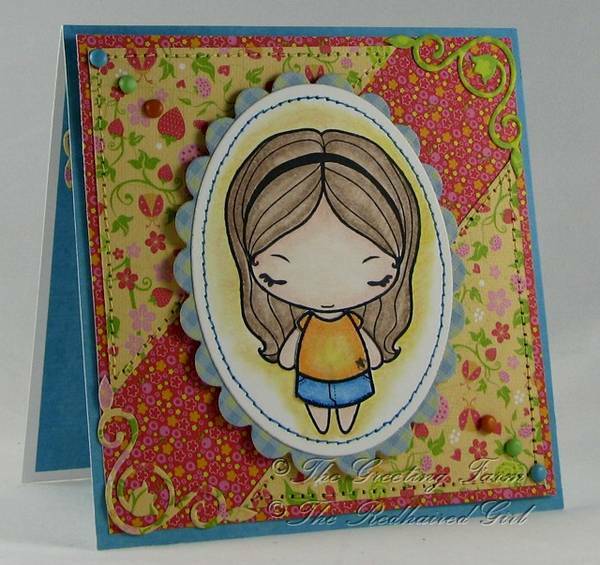 The TGF images are Stampin' Anya and, the new November release, Wild Sprout Matilda. They are colored in copic markers, and their shirts are paper pieced. I used a Mickey icon punch to make the hats, by cutting a bit off the bottom of the icon. Anya is cut with a classic circle nestabilities, embossed, then inked with Pool Party, then mounted on a basic black scalloped circle. I wrapped white grosgrain ribbon around the base and tied with a piece of baker's twine and a red button. I have skipped a sentiment for now. Ahhh, we are in the final month of TGF's Heart Journal challenge. This week's challenge is "Chaos" - no neatness allowed! Yea, I am one to go tidy, so this was a challenge. I started with Tim Holtz tissue tape and overlapped and skewed them. Next, I made a wash with Kelly Green acrylic paint and water. (I don't use green often, so I purposely picked it to work with.) I tried to darken the edges a bit and lighter in the middle. Once that dried, I used a polka dot stamp from SU and Wild Wasabi to stamp the bottom and sides, with a random one tossed in on top, then inked the outer edges. I used the Tim Holtz clock and gears masks, dousing them in Silver Foil Smooch Spritz. Once dried, I added the title with Tim Holtz tile stickers and -for some complete randomness- I added a blinged cherry decal. It makes absolutely no sense, but that's part of the idea, right? This week's Heart Journal assignment is "Parents" - make a spread centered around your parents, life as a parent or parents in general. One of my favorite quotes is from "Fern Gulley: The Last Rainforest" and it says "We didn't inherit the earth from our parents; we borrowed it from our children." I took that a step further and made my spread centered around the concept of Mother Earth. It's another Monday Funday at the TGF Farm Fresh Challenge blog! Today's challenge is a sketch by our own, Margie Cortina. The base of the card is Chocolate Chip with layers of Very Vanilla and Old Olive. I took the sketch and rotated it on its side. 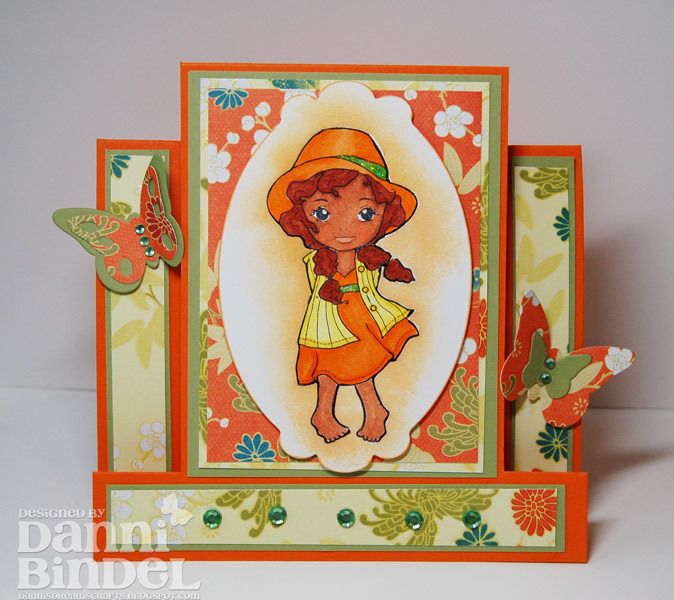 The Very Vanilla layer is dry embossed with the Cuttlebug polka dot folder. 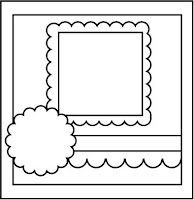 The scalloped border is Whisper White with brown polka dot grosgrain ribbon. The image is Navajo Anya and is colored in copic. I masked over top of her, then stamped a medallion over top, then embossed in clear embossing powder. Once cooled, I sponged olive chalk ink over top, then cut with a classic oval nestabilities, then mounted over the scalloped oval with dimensionals. The scalloped oval is from Cricut's Ashlyn Alphabet in Pumpkin Pie. The sentiment is stamped in olive chalk ink on Very Vanilla, then punched with the wide oval and mounted over the decorative label punch. I added a couple of pearls to the sentiment. The card is an easel style but displayed on its side. The inside is decorated with leaves stamped in Whisper White craft and embossed with clear powder. Once cooled, they are cut out and mounted on dimensionals. I used a scrap of Early Espresso baker's twine to tie on the brown leaf. The medallion, leaves and sentiment are from SU's Day of Gratitude set. It's my turn to host Friday Spyday over at TGF's Farm Fresh Challenge blog. I wanted to stick with our fun Twilight inspired theme, so I hit the Wild Sprouts section of the gallery and spied....Mercy! 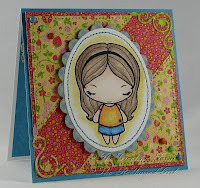 I love her colors and card style and her little WS Odette is to die for! My card is Chocolate Chip with layers of bubble gum pink and SEI Valentine themed paper. It is double sided so I used both sides in the design. The image is WS Dressy Joyce digi and is colored with copics and has little pearl earrings added. She is mounted on a class oval nestabilities. The blocks are stitched before assembly and some brown polka dot ribbon added. The felt heart is Heidi Swapp. I punched the paper hearts from scraps. The sentiment is from Artful Inkables Fictionally Inspired stamp set and is stamped in Timber Staz-On, then mounted with dimensionals. Inside, I have a special surprise for my friend. The Bella bracelet is made with a heart crystal and the pewter wolf charm is inked in Timber Staz-On, then heat set. I simply used a perferator, then folded the flap in, punching a couple of holes using my crop-a-dile. To seal the flap, I used two mini silver brads. Our friends at Pixie Dust Studio Challenge decided to celebrate the newest Twilight Saga movie by having a blog hop! Our task: create a project using PDS Twilight images and use red, black, white or silver and add some sparkle. You should be arriving from Cheryl's blog. I have had this paint can sitting around, so I used some Jet Black Staz-On to ink it up. All images are colored in copic markers. The lid has the "And so the lion fell in love with the lamb" quote printed in Twilight font and combined with the lion and lamb (True Love) digi. The side of the can is the Eclipse camp site scene. Edward and Jacob (Fire and Ice) are fighting for Bella's (Eclipse Bella) attention in front of the tent, while Seth (Wolf Jacob image shrunk and flipped) sits at Edward's side and Victoria (not shown) is off to the side biding her time. I used some snow paint to add some dimension and ground the characters to the scene. 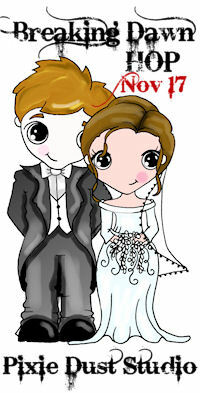 The other images are Edward and Bella (Marry Me...Bella) and the meadow (Love Sparkles). Edward's skin is sparkling with Spica pen, but I couldn't get it to show in the photos. I also have quotes that go with the scenes. I used bits of the challenge color ribbon and a "twilight" icon keychain to finish the piece. To get your own fab Pixie Dust characters, hop on over to Pixie Dust Studio. All images used are available in the Twilight Mega Pixie Pack. This week's Heart Journal assignment is "Soul Food" - create a spread around a favorite food or drink. My absolute favorite treat...See's Candies. YUMMY! Of course, I don't live anywhere near one, so I have to rely on the kindness of my mother to send them as a special treat from time to time...and are they coveted when a box arrives. Yea, like we were going to let Breaking Dawn pass without a Twilight inspired challenge. 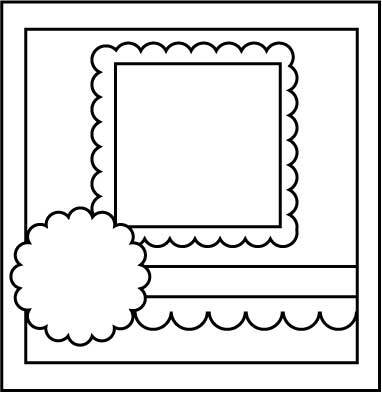 Today's Farm Fresh Monday Funday challenge is to use red, black, white and/or silver. If you have any of the Wild Sprouts, pull them out and make them shine! The base is Cherry Cobbler with layers of Very Vanilla and designer papers from Paper Studio and Recollections. The card design is based on Mojo Monday 210. The border is Martha Stewart's drippy goo punch. The checkered ribbon reminds me of Breaking Dawn chess pieces and was purchased at Michael's, then topped with a black pearl. The image is Wild Sprout Logan, colored in copics, then a clear Spica pen was rubbed over his face to give a little sparkle. I gave him a cloak to make him the Volturi guard member Demetri. To make the cloak, I used a piece of post-it not to cover the lower half of Logan to create a mask. Next, ink the stamp with Whisper White craft ink, remove mask, and stamp on Basic Black. I used a white gel pen to finish the robe and went over the lines of the hood to darken. Next, I used a craft knife to cut out the face, trimming the outline of the robe with scissors. Then, I used a glue pen to attach over the top of the colored image. There you have it, a Volturi robe-clad character. The sentiment is stamped with a Studio g dollar alphabet stamp on Very Vanilla and the quote is from New Moon. A few pearls on the bottom right corner, finish the card. It's another Friday Spyday at the Farm Fresh Challenge blog! This week is a lovely card by theredhairedgirl. It's time for another Farm Fresh Retro-Fresh challenge! This month, not only do we use a TGF stamp that is at least six months old, but use turquoise and berry pink colors. I am sticking with using Twilight-inspired Wild Sprouts Ebony and Hugh. The base is Tempting Turquoise with layers of Rich Razzleberry, bubble gum pink, and DP from my local scrap store. The border punch is card suit from EK Success. The image is colored in copic markers, then cut out with nestabilities. I used some mini brads from SU and a bit of ribbon. The sentiment is printed in Twilight font, punched with 1 3/8", 1 1/2" and scalloped circle punches, then mounted with dimensionals. The card is called a "Joy Fold" card (tutorial on SCS). Don't forget that the DECEMBER Guest Designer contest ends 11/10, so make sure to get your entries in to Jess before the big reveal of Phase 1 on our Facebook page on Friday, 11/11! If you're not able to join us for the live chat no worries- we will be doing these at different times of day to include our overseas friends when we can. Challenge will be open ALL weekend, too, so there will be time for EVERYONE to play! We'll wrap up about 10pm CST or whenever we conk out- but for now, get ready to join us for a night at the movies! Yay, I'm ahead of the curve this week! Missing the deadline last week has had me falling all over not to miss another one. This week is "Heart to Heart" - create a spread using hearts or have a "heart to heart" with your soul. Yea, not one of my preferences right now...it will only lead to ugly things. It's another Monday Funday at the TGF Farm Fresh Challenge blog! This week's challenge is NO designer paper and use 1 ribbon. This week's TGF Farm Fresh Friday Spy-day challenge is with Danni! Be sure to hop on over to the TGF FFC blog to check out the samples and play along. Don't you just love the rich paper...reminds me of origami paper! Can you believe I couldn't remember it is Thursday? Yea, I messed up and forgot my Heart Journal. This week is "Stickin' To It". Hmmm, well, what to do? I decided to do another Twilight inspired page. I wanted a vintage feel with some wedding type momentos. Today is TGF's November release day! Meet Wild Sprout Matilda...one of four new rubber stamps from The Greeting Farm! The card design is inspired by Deconstructed Sketch #23 (I know, it's late, but better late than never!). The base is Whisper White with layers of Brilliant Blue and Pawsitively Prints DSP. Matilda is colored with copics and the corners notched with a ticket corner punch. 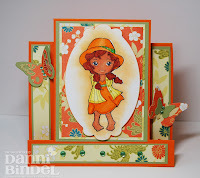 I used the scallop border punch from EK Success and Stampin' Up. I added a couple of pearls to the top left. The sentiment was printed on cardstock in Comic Sans font, punched with the word window punch, and mounted on a wide oval and decorative label punches. I used some white twine to make the little bow before mounting with dimensionals.